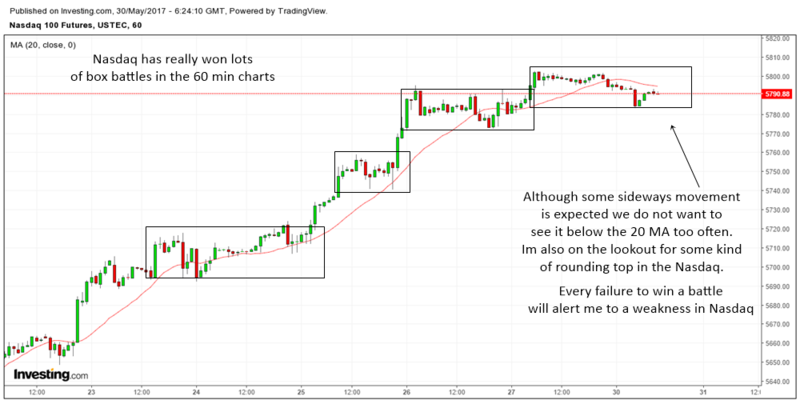 After a long weekend, the Dow Jones Index look set to begin the trading week sideways in the 60 min charts. 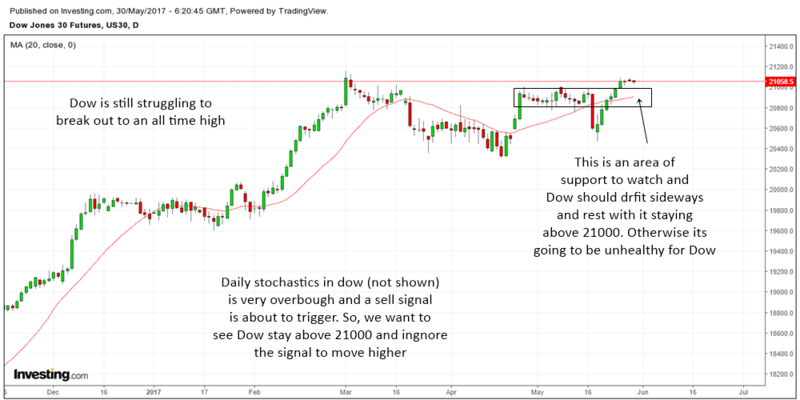 There is ample support below in the 60 min charts and Dow is just hovering around the 21000 area finding support there. Which way will it continue to go? 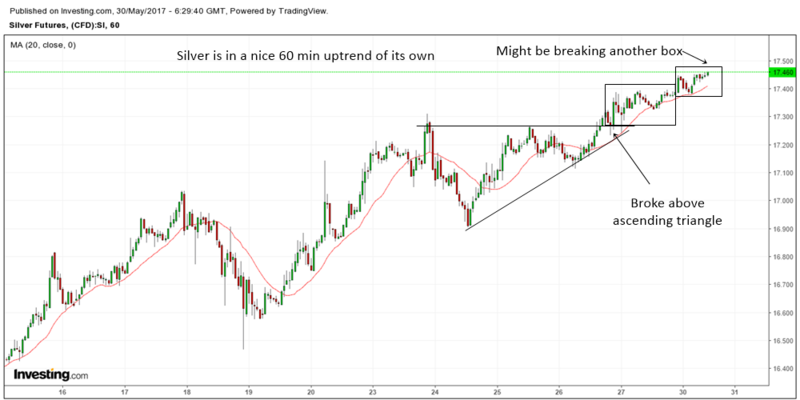 Will it breakout higher and make another new all time high? The S&P 500 index and the Nasdaq has already performed this wonder a few times but the Dow is still struggling to move higher. After a nice bull run, its normal to see the indexes move sideways a bit. Its healthy and as long as the indexes are not forming some kind of topping pattern in the lower time frames, we are still alright and the bull run looks set to continue in the future. I will be on holiday for the next few days so might not be able to update at all. If able to update might be just a few charts. Dow had a nice bull run lately but daily stochastics tell us it is quite overbought at the moment. Some sell signal is coming in but I won't worry too much as long as Dow stays above the 21000 area. Once the stochastics is ignored, the likelihood of rising increases. 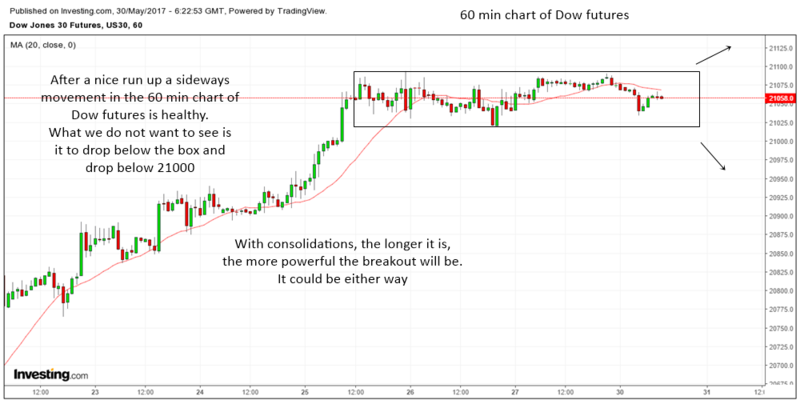 In the 60 min chart of Dow, we are able to see that it is drifting sideways at the moment. Zig zagging up and below the the 60 min 20 MA. Difficult to make money at this moment. 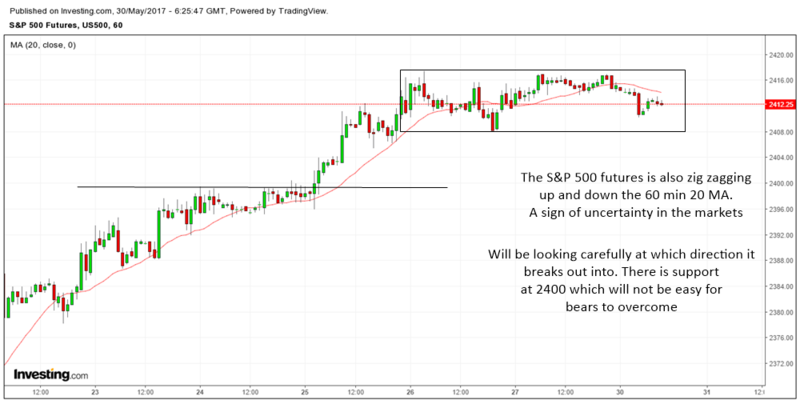 Will be looking if it can break above the box consolidation for smoother trades. 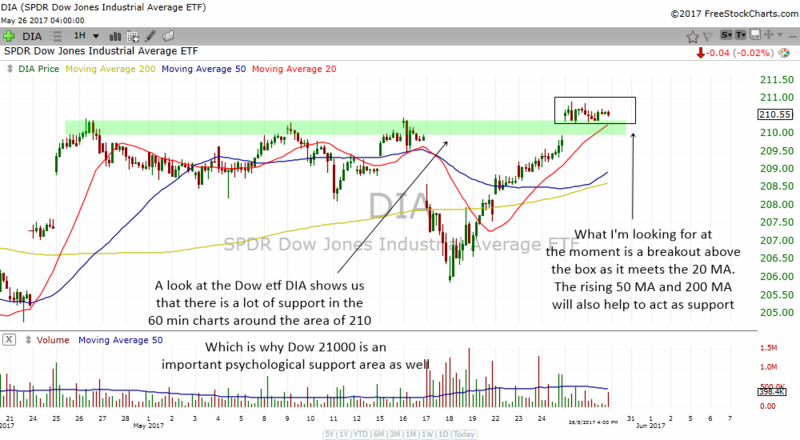 The DIA chart looks cleaner and the 60 min charts shows us the 210 area is great support which it should not drop below. Currently it is forming a box and once it meets the rising 20 MA hopefully a breakout will occur. Apple is also very crucial to the Dow now. While most tech stocks have been rising, Apple has not been really rising. Just moving sideways. This consolidation will not last. Either it will break out or breakdown. 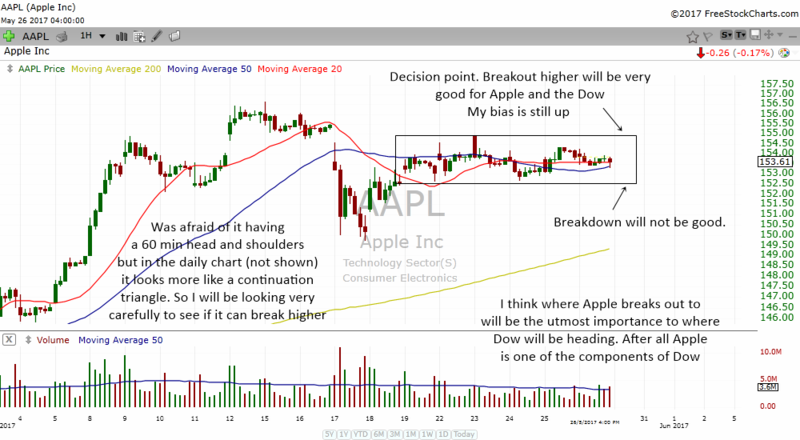 A breakout will send the index higher as Apple is a component of the Dow. 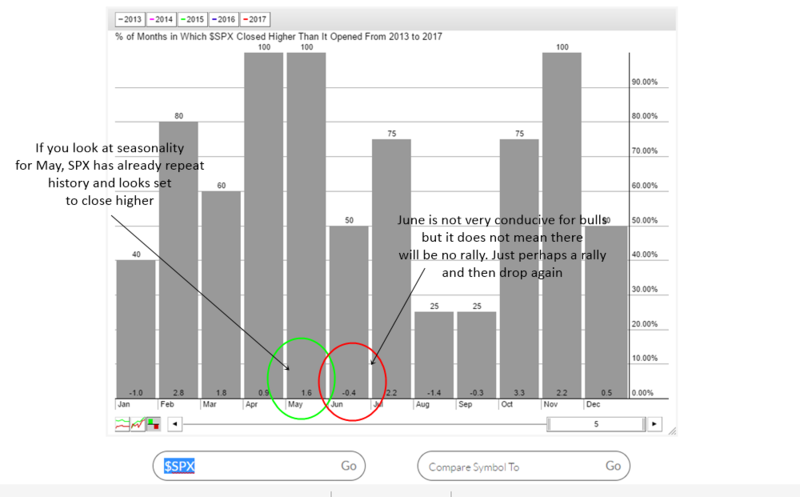 Seasonally, I think the SPX, Dow and Nasdaq has all performed well according to the script. They are now above their opening price in May. So history repeats itself again. June is usually not so good with it closing higher 50% of the time. Seasonality is just a guide. Just because it closes higher or lower does not mean the index will crash or have a bull run. We use it intelligently to come out with probabilities. For example, when the Dow crashed 2 weeks ago, seasonality will tell us that the probability of the crash will end at support and Dow will move higher is very good indeed. 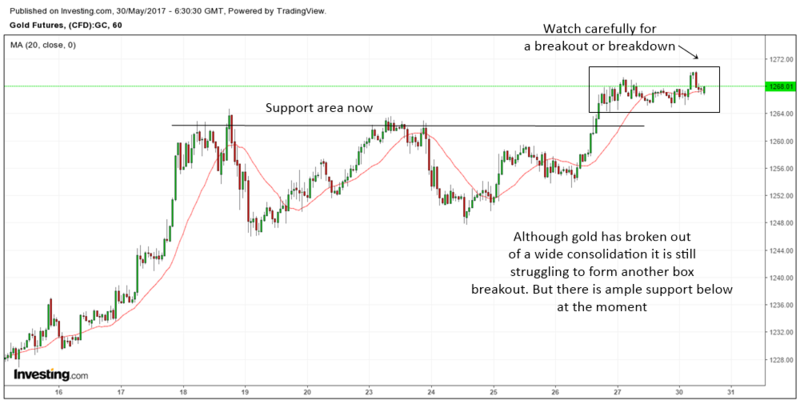 Silver and Gold are in their own bull run in the 60 min charts. Any continuation pattern is highly likely to follow through. June are usually slightly in the positive side for these two commodities. 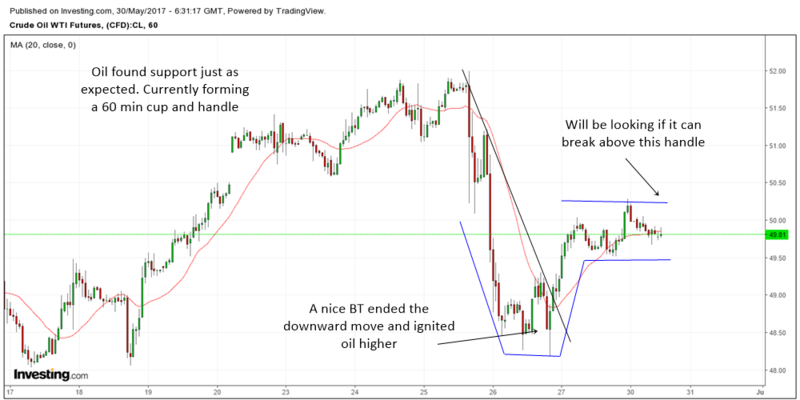 Oil is forming a 60 min cup and handle and which way it breaks out of the handle will be crucial.